HARDI Australia has recently released the MINIDRIFT range of air inclusion nozzles for use with the HARDI range of sprayers. The Minidrift range of nozzles produce a range of droplets from medium to very coarse depending on the selected nozzle size and pressure. It is designed to work at operating pressures between 1 and 5 bar making it ideal for use in a range of spraying operations. The Minidrift incorporates a venturi which draws air into the nozzle mixing chamber infusing air into the liquid droplets. The Minidrift nozzle range is a two piece nozzle which allows simple service access if cleaning is necessary. It is manufactured in line with ISO flows, colours and sizes and fits the HARDI 334083 adaptor cap and a range of other caps. Farmers with an existing HARDI sprayer simply need to purchase appropriate MINIDRIFT nozzles and cap to fit existing HARDI saddles. Air induction nozzles like the Minidrift are developing a larger role in spray management practices due to there ability to be used for drift control without risking poor coverage and deposition on leaves. There is also more information being provided on chemical labels in relation to recommended droplet spectrum. Minidrift produce a range of droplets in a spectrum recommended for use with many of Australia's major chemical products and provide an excellent addition to the HARDI range of nozzles. 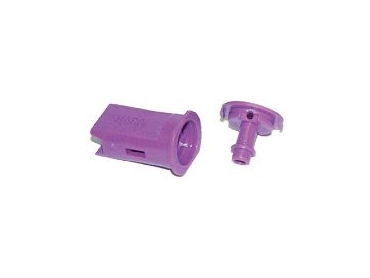 Minidrift nozzles are available either singly or in six packs and are priced very competitively at $8.90 each plus GST.